Spoonfuls of Sugar: Nanny McPhee Returns is a bright, silly kindergarten comedy with a lesson. Isabel Green (Maggie Gyllenhaal) is a frazzled mom, and her young children (Asa Butterfield, Lil Woods and Oscar Steer) are a handful. But there’s good reason for them all to be on edge: Dad is away fighting a war. (The whimsical 1940ish English-countryside setting suggests World War II, but this could easily be today.) Mom is fending off her brother-in-law (Rhys Ifans), who is pressuring her to sell the family farm. And now, city cousins (Eros Vlahos and Rosie Taylor-Ritson) are coming for a visit, and the place is an absolute mess. And so it’s the earthy country kids versus the snooty city kids ... until magical Nanny McPhee turns up. Star Emma Thompson (who also wrote the script) is once again a stern, scary presence, not just physically—though her warts and snaggletooth contribute to her stolid implacability—but also as a personality. She does not brook any disobedience. And she’s got magic to back up her instructions—magic that will make spiteful or hateful little children sorry they have not been nicer. Nanny McPhee Returns lacks the dark humor with adult appeal of the first film. But it’s hardly a chore to sit through as an adult, either. The bright silliness of this sequel—cute swimming piglets; a burping bird—may be kindergarten comedy, but it doesn’t overwhelm the more pertinent points about learning to be generous, cooperative, and kind the story gently sets out. TV director Susanna White, making her feature debut, works magic herself, transforming the lessons into something that feels almost accidental, happy side effects of the madcap adventures the children get themselves caught up in. 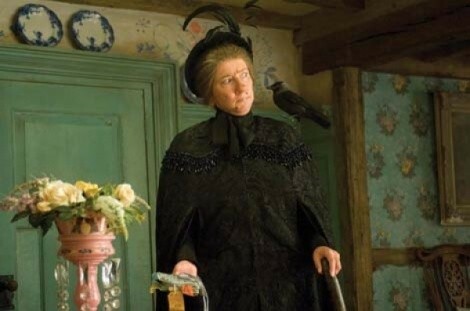 And again unspoken is the lesson of Nanny McPhee herself: She gradually becomes more beautiful the better behaved the children become—her warts disappear, for instance—as if to suggest that manners and kindness make the world a nicer place to live in.